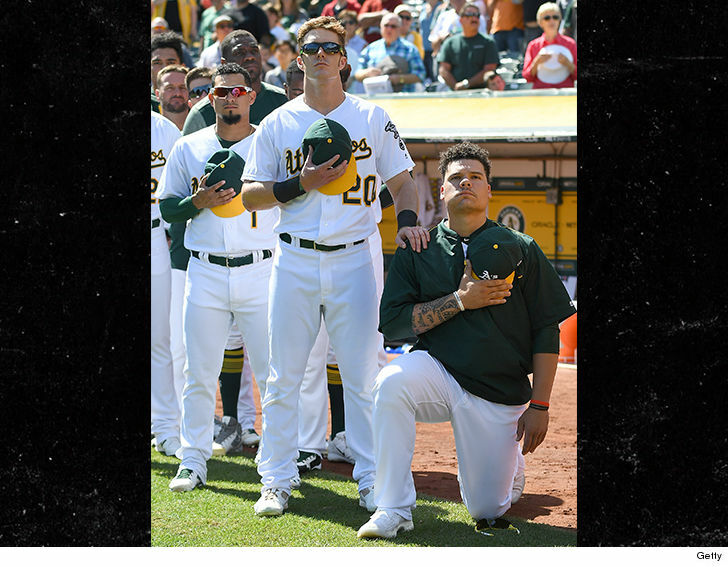 Oakland A’s catcher Bruce Maxwell — the only MLB player who took a knee this season — tells TMZ Sports he was confronted by a pro-Trump waiter at an Alabama restaurant who refused to serve him. Maxwell says it all went down at a lunch with a local politician — and after they complained to management, they got a new server. But Maxwell says there’s been a lot of POSITIVES that have come from his demonstration — including a new friendship with Colin Kaepernick who’s sort of mentoring him now. Maxwell also says some very big names from both the NFL and MLB have reached out to lend their support … guys like Dusty Baker, Coco Crisp, Torii Hunter, Adam Jones and more. He hopes to unite everyone to help spread Colin’s message. We know where they WON’T be having the next lunch meeting.